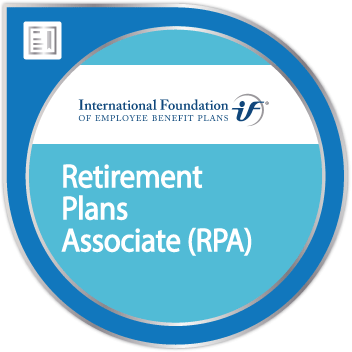 The RPA designation is a great credential for those who work with defined contribution and defined benefit plans or are involved with the management of plan assets. The courses reflect the most current and relevant information needed to effectively design and manage retirement plans. RPA 1 - Retirement Plan Design (required). This course focuses on individual retirement needs, employer-sponsored programs, and plan design considerations. The differences in defined contribution (DC) and defined benefit (DB) approaches are detailed. Additionally, an overview of various types of retirement plans, the primary provisions of Social Security, the fundamental characteristics of tax-qualified plans and the workings of distinct types of DC plans are explained. RPA 2 - Retirement Plan Management (required). This course examines approaches to enhancing retiree financial security. The impact of various types of retirement planning structures and the importance of effectively managing retirement assets are discussed. The course focuses on investment principles in accumulating retirement wealth and the essentials of fiduciary oversight and plan governance by plan sponsors. RPA 3 - Asset Management (elective). The course introduces asset management in the context of setting investment objectives for pension plan assets. It then provides the necessary background on financial markets, how they are organized and how they operate. The concepts of risk versus return and efficient markets and the impact of modern portfolio theory are presented, followed by a detailed discussion on bonds, stocks and derivatives. RPA 4 - Personal Wealth Management (elective). This course provides comprehensive and authoritative treatment of knowledge and best practices for the emerging discipline of personal wealth management. Since wealth management holistically integrates such specialty areas as personal goal setting, risk analysis, investment management, retirement income forecasting, and estate planning, the course surveys these inter-related yet distinct topics.